In this lab you will explore the behavior of light at the boundary between two transparent media with different indices of refraction. A fraction of the incident intensity will be reflected, and the rest of the light will be transmitted. 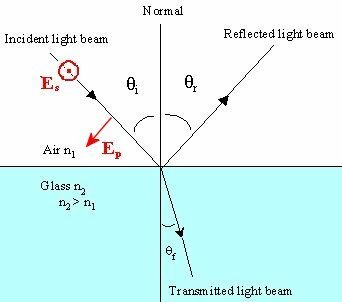 The direction of propagation of the reflected and transmitted light is given by the laws of reflection and refraction. Snell's law or law of refraction: nisinθi = ntsinθt. How much of the light is reflected and how much is transmitted? The reflectance R is the ratio of the reflected flux to the incident flux, and the transmittance T is the ratio of the transmitted flux to the incident flux. Energy conservation requires that R + T = 1 (if there is no absorption). R and T depend on the indices of refraction of the two media n1 and n2, the angle of incidence θi, and the polarization of the incident light. We distinguish between p-polarization and s-polarization. Consider, for example, an air-glass interface as shown. The plane of incidence contains the normal to the boundary and the incident ray. The electric field vector E of the incident wave is perpendicular to the direction of propagation and can have a component in the plane of incidence, Ep, and a component perpendicular to the plane of incidence Es. We have E = Ep+ Es. Rs = ((sin(θi - θt)/sin(θi+ θt))2.
n1sinθB = n2sin((π/2) -θB) = n2cosθB. Open a Microsoft Word document to keep a log of your procedures, results and discussions. This log will become your lab report. Address the points highlighted in blue. Answer all questions. Use an on-line simulation from the University of Colorado PhET group to explore the bending of light. Tools and objects can be dragged out of the tool box and then returned. The objects in the Prism Break tab can be rotated by dragging the handle. In the Prism Break tab, the protractor rotates and the laser translates. All the tools work in both Ray and Wave mode, but some are easier to use in Wave mode because the region where the tool can read is larger. (a) Let red light move from air into water. For incident angles θi from to zero 80o in 10 degree steps measure the angle of refraction θt and the reflectance R.
Download this spreadsheet and enter your measured values on sheet 1. Plot R versus theta. Paste your graph into your log. Compare to the graph above. Is the laser light p-polarized, s-polarized, or unpolarized. What do your results suggest? Remember that Excel functions require the angles to be in radians. Into cell D2 enter =sin(A2*pi()/180) and into cell E2 enter =sin(B2*pi()/180). Copy these formulas into the other cells of columns D and E.
Use the trendline to find the slope. Paste the graph with trendline into your log. What value do you obtain for the slope? Given Snell's law, what value do you expect for the slope? Discuss! (b) Design experiments to determine the index of refraction of mystery materials A and B. Describe your procedure and discuss why you decided to proceed this way. What are your results for nA and nB? (c) Design and describe a setup that has the refracted ray bend away from the normal? Paste a screen shot of your setup into your log. (d) Click on the prism break tab. Use red light with a wavelength of 650 nm. Try to arrange various prisms in such a way, so that the laser beam after total internal reflections moves parallel to the incident beam but in the opposite direction. Try to use as few pieces as possible. Paste a screen shot of your design into your log. (e) Now switch to white light and experiment with various prisms to answer the following questions. Are the reflection and refraction of light color-dependent? How can you tell? Which shapes split the white light into different colors the best? Did you find a set-up that demonstrates this well? Try to arrange a situation so that the light light forms a rainbow. What shape did you choose? In this experiment you will trace the path of a light ray through a block of glass. You will determine the angle of incidence and the angle of refraction at two air-glass boundaries and use these angles to determine the index of refraction of crown glass. For an air-glass boundary we can set the index of refraction of air equal to one. Measuring the angles a light ray make with the normal to the interface both in the air and in the glass, we can solve Snell's law for the index of refraction of the glass. The images below show a laser beam passing through a square block of glass. The angle of incidence is different in each of the images. Click on each thumbnails to obtain a larger image and print out that larger image. For each larger image carefully complete the diagram as shown n the figure below. Measure the angles θair and θglass with an uncertainty of less than 1o. Use a protractor, or count squares on the paper and use trigonometric relations. Measure the width w of the block and the displacement d of the ray with an uncertainty of less than 1 mm. The sides of each small square on the paper in the images are 2 mm long, the sides of each bigger square are 1 cm long. Scale your measured w and d appropriately (or count squares) and enter your measurements into the table on sheet 2 of your spreadsheet. Measure the displacement d of a ray passing through the glass block and enter your measurements into the table. Use the results you obtained from each of the images to determine the index of refraction n of crown glass. Find the average value. Record this in your log. Find the percent difference between this average measured value and the nominal index of refraction for crown glass, n = 1.52. Record this percent difference in your log. d = wsin(θair - θglass)/cos(θglass). Use your measured values of the width of the block w and of the angles θair and θglass to calculate d. Compare this calculated value with your measured value of d and find the percent difference. Insert your table into your log. Comment on your three diagrams. How does the deviation d vary with θair? Save your Word document (your name_lab10.docx), go to Canvas, Assignments, Lab 10, and submit your document.